" Its a tragedy of the first magnitude that millions of people have ceased to use their hands as hands. Nature has bestowed upon us this great gift which is our hands. If the craze for machinery methods continues, it is highly likely that a time will come when we shall be so incapacitated and weak that we shall begin to curse ourselves for having forgotten the use of the living machines given to us by God." 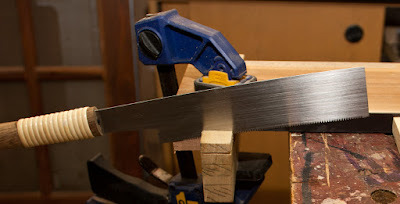 Hobbyists sometimes tend to spend thousands of rupees on power tools, some they end up barely using, which in my view is a little wasteful given that a cheap hand tool with a little practice can often be an equally versatile and accurate instrument. Hand tools have several other advantages as well: they are safer than power tools, much quieter and do not require complex jigs for different tasks. 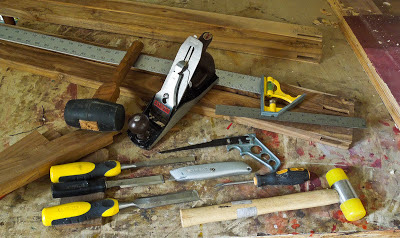 As I do more and more woodworking, I find myself preferring hand tools.Here are some of my pages in this blog which talk about hand tools. Makes an interesting reading. But, for a person like me who just has interest but no exposure as to how to set out on the hobby, perhaps more elaborate guidance is necessary on the sort of tools and the simple things to accomplish with it. It will be nice if some videos explain the elementary go-about! Laxman: You have a point. 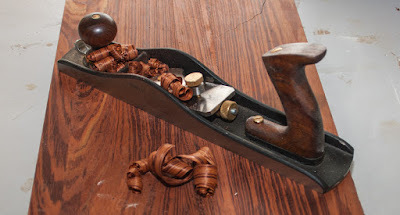 I will make a short video on the basic woodworking tools required. Thanks for the suggestion. I am wondering where one can find these tools for purchase in India. Did you buy them online? Good see at least one Indian handtool enthusiast. I have bought most hand tools from Shobha Industries (http://www.shobha-india.com) and online sources such as toolsfromjapan.com, Good Will (http://www.goodwill.in) and so on. Indranil sir - I have sent almost 2-3 emails to Sobha industries but have not received any reply. I was interested in their planes and maybe a fret saw (saw Paul Sellers cutting out the dovetails with a fret saw and it looked like easier than using chisels which is used by John Bullar). could you maybe help in this regard? Siddhartha: Very strange:) Try sending an email to the MD at rajiv@shobha-india.com or try their number 011-43118888. I have many of their planes, really excellent stuff as well as three of their fret saws. Extremely useful. Worth getting. Best of luck. The article which you have posted is great. Thanks for sharing this information. Hi indranil, i am looking for good mortise chisels for mortise joints. Will you please recommend good one if you know. Deepak: Try mortise chisels made by Anant. They are pretty good - made of Chrome Vanadium steel. Extremely hard but difficult to sharpen. I share the passion of handtools with you, have been working with my hands since my childhood. Your Blog is good, meticulously and painstakingly written. Please keep it up. Many thanks! Appreciate your kind words. Hi, where in india, preferably bangalore, can I pick up japanese tools. Esp saw and chisels. Thanks. 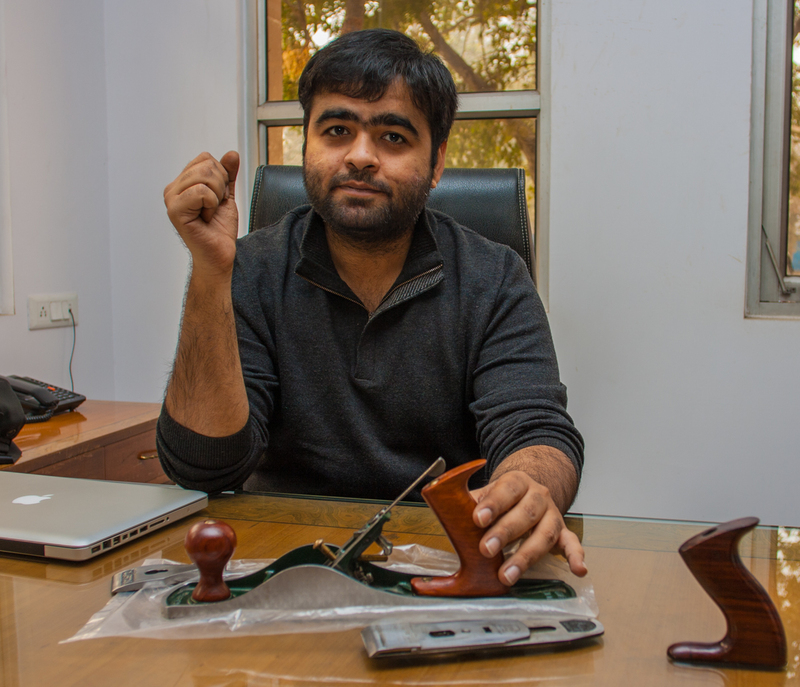 Indrajit, Japanese tools are not available anywhere in India. You will have to import them from online stores, which is quite easy these days. Can you please suggest any online site in india, selling face vise ? I am finding some on global sites like http://www.amazon.com/Grizzly-T24249-Cabinet-Makers-Front/dp/B00DQJQGPA which will make costing double by adding import duty and overseas shipment. I find plenty of shoulder vises from shoba,nicon, lion, anant etc, but I need the one without cheek and where I need to put full/complete wooden jaw. I don't think you will find this kind of a vice in India. I would suggest you to contact the customer care of labkafe. Though I can't see the vice on their site but at times they have supplied using their offline channels. Thanks saurabh. But the vice listed there doesn't seem like for woodworking purpose. I will enquire it through their customer service. Nevertheless I have already ordered a 10.1 quick release vise from shobha industries to use it as tail vise. Hello Kingshuk, tolexo is selling the same plane for 3.5k. Give it a try. Bhairavnath, is it the Anant plane? Also is Tolexo reliable? Yes, Indranil its Anant A45. Tolexo is reliable. You can return it if you don't like the item. Bhairavnath, I can't seem to find the link in Tolexo - could you please share it. Thanks. Here is the link Indranil. Could not resist temptation! Ordered the darned plane. Same here! Just got a message from Tolexo - fraudsters! Indranil, can Black & Decker KW900EKA Plunge Router do all the things that A45 multi-plane does? I would better spend 6k on router than multi-plane. I don't know about the B&D Router but a router can do many things - cut grooves, rabtes, channels, beads, profiles and so on. 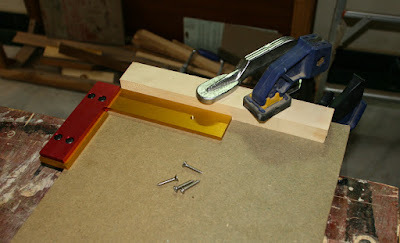 The trouble is for each task you generally require a different router bit, some of which can be expensive. The overall costs would be much higher but that should not be a reason for chosing one over the other. Yes, you are right. But choosing router over multi-plane would give flexibility I believe. KIngshuk, I wanted to buy one too but the local dealer did not have it; perhaps they now do. I haven't handled the plane but theoretically it should be able to do a lot. Some people say that the plane is difficult to set up and use though. But would be worth experimenting with if you have the money. Your blog is an excellent source of information as well as a place for people with interest in furniture / woodwork. As as architect with interest in furniture design, I have profited by reading some of your posts. Please keep up the good work and I hope to meet you some day as I am located in Delhi NCR as well. Many thanks, Siddhartha. Email me at indian.woodworker@gmail.com anytime. Hi Indranil, can you tell me how long does it take for a Japnese saw to come to India if we choose the EMS option? Can anyone tell me as what is BASOLA called in English. It is a hand tool with short wooden handle for chipping wood. Frequently used by old carpenters in villages. Produces a rough work.